It seems appropriate that I start my first blog for 30 Days Wild with a piece about my first visit this spring to the Reffley Reservoir. And there followed a whole succession of firsts as well. 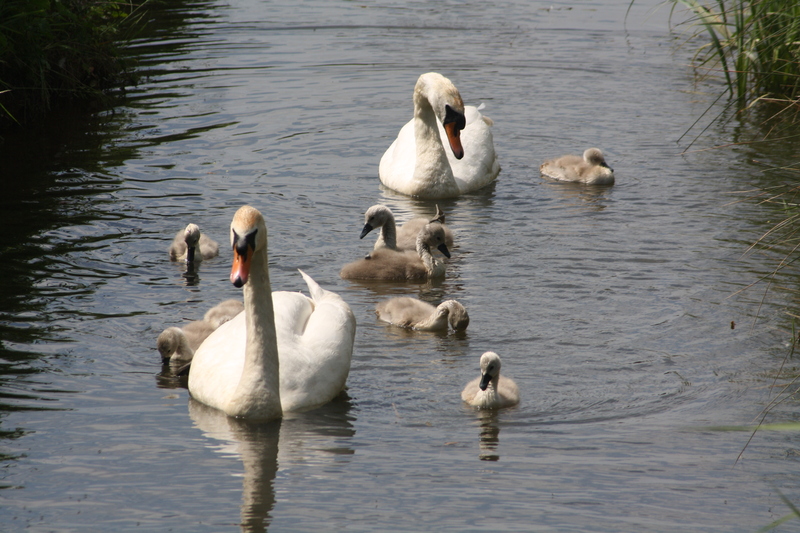 The first thing I saw on June 4th was a swan family, swimming together in a dyke close to the reservoir. I walked along until I could get a good view of them and maybe take some photos. I watched them swim slowly towards me, hoping the male swan would not see me as a threat. To start with, it appeared there were six cygnets, then I saw a seventh and finally, when they’d reached the end of the waterway, I realised there were eight! I was lucky to see the young when they were a few days old. The previous week, they had still been on their nest on another part of the reservoir, which acts as a flood storage area for the Reffley housing estate, where I live. The swan family enjoy an afternoon swim. The eighth cygnet is behind its parent. Then my husband pointed out my first damselfly of the season low in the grass near my feet. I was pleased with my picture, but must try and include the diagnostic marks on these creatures so I’m sure which one I’m looking at! However, after checking with Norfolk dragonfly expert, Pam Taylor, I am sure this one is a male common blue. The first damselfly I’ve seen this year, a male common blue. 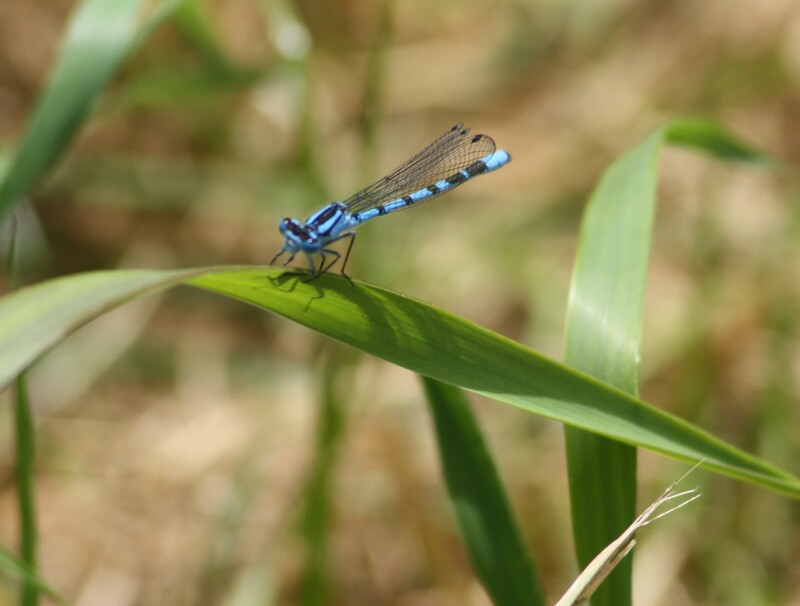 My husband saw quite a few damselflies, all floating amongst the grass, probably because there was quite a strong breeze, despite the sun being quite warm. I’d been wondering if I might come across the coot family my daughter had told me about. And luckily, just as I was beginning to give up hope, they emerged through the reeds! I saw one adult and maybe four young – it wasn’t easy to tell as they were drifting in and out between the tall plants. This was certainly the first time I’d come across coots at the reservoir. I’d seen their cousins, moorhens, but never coots. It was a delight to see the parent interacting with the youngsters. A young coot is fed by its parent. Another highlight of my visit was seeing my first batch of common blue butterflies this season. At least, I believe they were that species, as they too were keeping well down in the grass. There was also a peacock butterfly and a male orange tip. Every now and again, a scratchy song rang out from the reed bed in the centre of the reservoir, which has a circumference of about one kilometre, but the singers never stayed in one place long enough for me to fix them in my binoculars! 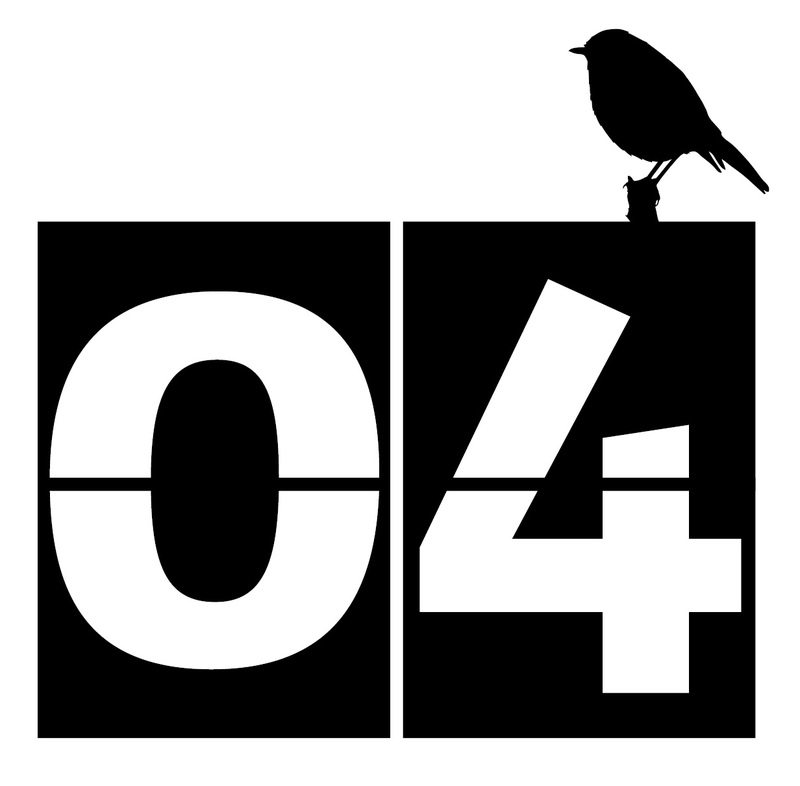 I did, however, recognise the calls of a chiffchaff, a green woodpecker, a pheasant and a chaffinch while I was on site. I also saw a magpie. The wild flowers were a delight, lots of large ox-eye daisies, bird’s foot trefoil, white and red clover, buttercups and plenty of tall grasses and reeds for the dragonfly nymphs to climb up as they leave their watery world behind. The clover was proving very popular with numerous bees, both small and not-so-small. I hope the local drainage board, which manages the reservoir and nearby land, will leave the flowers to bloom for longer this year as they are a haven for insects, as well as being a beautiful sight for people to enjoy. We are really rather lucky in this part of West Norfolk. The reservoir is a wonderful wild place and at one end of it you can wander into a 130-acre ancient wood. There is also a smaller gem of woodland just round the corner from our house, along with quite a large green area. Also, the Gaywood River, which, being a chalk river, is a very important habitat, flows close by and into our nearest town, King’s Lynn. An informative read, one day I will have break away from Spring wood and take a stroll down by the reservoir.